Mr. Jerome Glenn from the Millennium Project, United States will give a keynote speech about the future of work and technology alternatives. In his talk, Glenn will present the preliminary results from the Real-Time Delphi study of the Millennium Project. Glenn’s presentation is followed by a discussion, chaired by Dr. Ulla Rosenström (Prime Minister’s Office – Valtioneuvoston kanslia). Registration for the event is obligatory. Foresight Fridays are regular meetings organised by the National Foresight Network. The themes and contents of these meetings vary and include foresight presentations, courses and networking. The meetings are open to all who are interested in foresight and futures research. 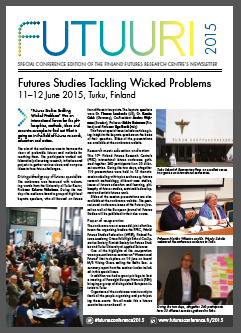 This event is held in conjunction of the annual Futures Research conference: “Futures Studies Tackling Wicked Problems: Where Futures Research, Education and Action Meet, 11–12 June 2015, Turku, Finland”, in co-operation with the Finnish Society for Futures Studies and Finland Futures Research Centre.